← A Visit to Coffee Plantations. Matlagapa, Nicaragua. My stint in the mountains was quite refreshing, yet I was longing for some fun in the sun. The Latina that I have been hanging out with had to go to a neighboring city for a few days, and hopefully I will get to see her again, but I’m also not going to wait around. Once the decision was made, I jumped on a bus and headed south to the beach. 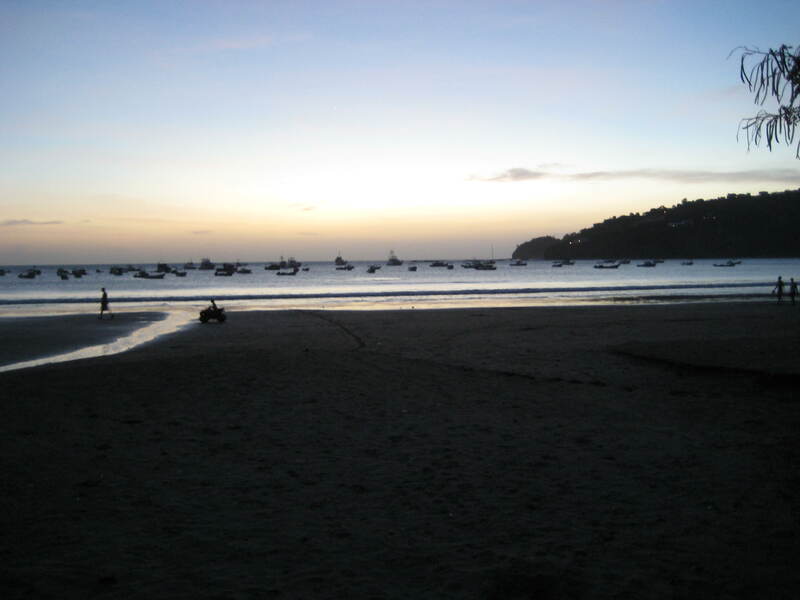 San Juan del Sur has an interesting dynamic. It’s by far the most gringofied town I have been to since I started traveling, but still offers certain charms that draw people in. Sitting on the Pacific Ocean, it is graced with beautiful sunsets that keep the tranquillo lifestyle in check. 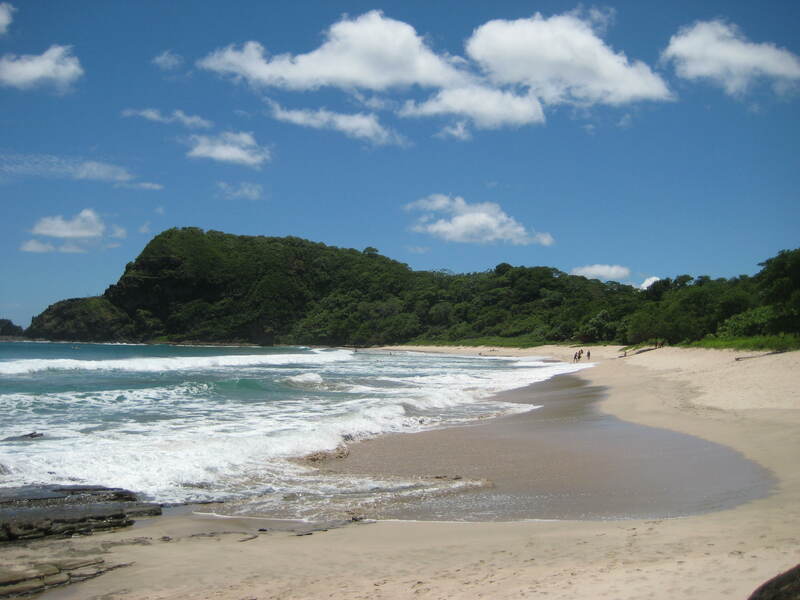 Although it is right on the beach, the more popular beaches are about a thirty minute drive north. I jumped into a shuttle to get there, and upon my arrival, I witnessed a hoard of surfers in the water. I summed up my surf experiences not to long ago, and I still cannot figure how people enjoy that sport. It’s always entertaining to watch them from the shore, especially when there is a group dynamic to be observed. After much observations, I have finally thoroughly researched what a surfers day looks like. Wake up. Stare in the mirror. Give yourself affirmation on the merits of the sport. Head to the beach. Paddle out. Sit up on the board. Look for a wave. Sit back down and paddle around. Go talk to the one girl surfer. Sit back up on the board. Get excited because a wave is coming. Get ready to take off. Decide the wave is bad. Honest reason is because they don’t want to paddle back out. Drop the word “narley.” Continue to paddle around all afternoon. Sing a Beach Boys tune. If lucky, surf one wave in a thirteen hour period. Sleep. Repeat. I know, I know, the reseach is pretty in depth. No need to thank me… I do it out of the love for sharing common knowledge. To get away from the ridiculous amount of surfers, a couple of amigos and I, amigos being friends, headed a good ways down the beach. After a twenty minute walk, we found a pretty deserted section, perfect for what we were looking for. The morning was spent reading, sleeping, and swimming. I tried getting them to play games such as Marco Polo or Don’t Get Wet, but no one seemed to interested. Don’t Get Wet is my favorite, yet extremely difficult to learn how to play. Pretty much, when a wave comes, you run as close as possible to it. The goal is to not get wet, hence the name, “Don’t Get Wet.” Creative…I know. But don’t worry, with much studying and practice, anyone can eventually learn how to play. When I suggested the game, everyone just looked at me weird and told me to grow up. We choose to go for a cold one instead, which honestly, I was just as happy with. The rest of the day was spent lounging around and engaging ourselves in wonderful conversations. I made it back to my hostel and was asleep within a few hours.